I just watched the latest episode of FRONTLINE, whose title, “Growing Up Online“, pretty much accurately describes the content. 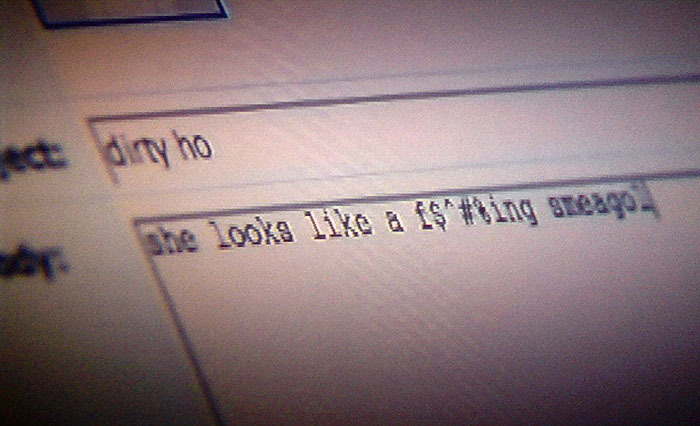 The show is excellent, and while I’m not inclined to share my specific thoughts about the program, I am compelled to show you this screenshot illustrating “cyber bullying”. I think cyber bullying would be much more acceptable if they carried it out with Shakespearean prose. Message: Me doth thinks the lady mirrors that of a dwarf like creature from Middle Earth. I noticed that diss as well and laughed our loud (LOL as the kids say). My wife didn’t know who Smeagol was so I had to explain. Do these kids know who Smeagol is? Or does it just sound nasty or something? Smeagol wasn’t that bad really… you’d think Gollum would be a bigger diss.